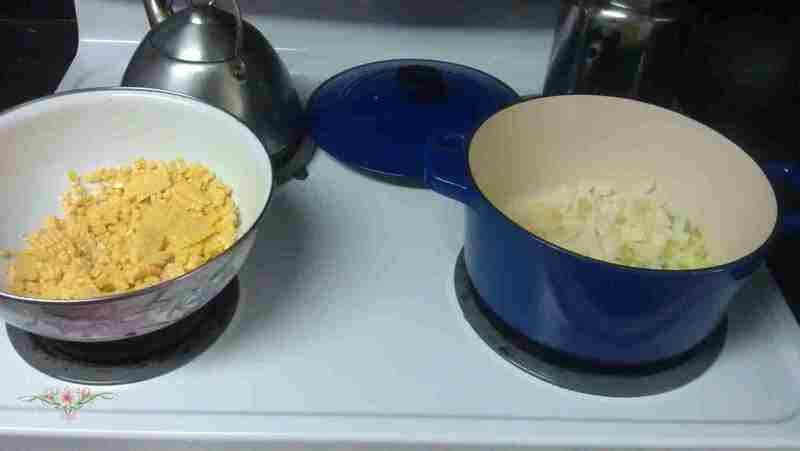 Melt the butter in a Dutch oven or soup pot. 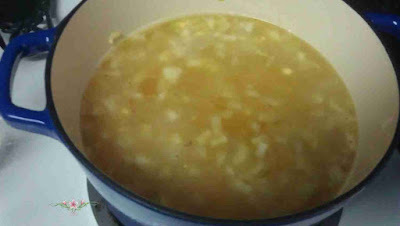 Add the onions, garlic and celery and cook until wilted. Add the corn and potatoes. Stir and add the brother. Bring to a boil and then lower to simmer. Adjust seasonings. When potatoes are cooked, add the milk and bring to a boil. If the soup needs further thickening, mix together 1 to 2 tablespoons flour with 1/2 cup broth or water until smooth and add this to the chowder. Heat until soup thickens. Julienne the carrots and daikon uniformly. In a large bowl add the rest of the ingredients and let the sugar and salt dissolve. 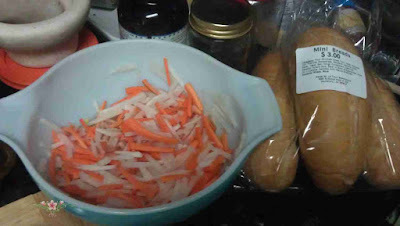 Add the julienned carrots and daikon and let rest until liquid from the vegetables are released. NOTE: if eating in the sandwich, make sure to drain the pickles otherwise the sandwich will be soggy. To assemble, place the bread in the oven and turn on the oven until it pre-heats. Remove from oven and let cool. Slice open the bread but be careful not to cut all the way through. Remove the inside of the bread if needed. Place a layer of the pickles inside each roll, layer with cilantro, watercress and Jicama slices. At this time our beloved State of Hawaii is considering going the way of other states in making physician assisted suicide acceptable and legal. We need your prayers and your involvement to assure that this does not happen. We presume that those who are proponents are acting out of what they believe to be very noble intentions. However, assisted suicide is yet another manifestation of what St. John Paul II referred to as the “culture of death,” while we are always committed to a culture of life. Proponents do not refer to this as “suicide,” since suicide always implies a tragic choice, but rather as compassion in choices. Can anyone be opposed to compassion? And does not God himself give us freedom to make choices in our lives? As your pastor it is my obligation to expose what seems to be an act of goodness and caring as just the opposite, as a wolf in sheep’s clothing appears to be what it is not. Proponents speak of the autonomy of the individual to make his or her own choice about when to die when faced with a painful or debilitating terminal illness. What strikes me as ironic, however, is that people have been committing suicide quite autonomously for thousands of years; yet now, in the name of “autonomy” one must have the permission of one’s doctor, lawyer, and legislature. Seeking such societal approval betrays full autonomy and exposes the fact that, deep down, people know this is not something good. The authority of others is being sought to give permission for what is against our human nature. Another reality involved is our “disposable culture” as Pope Francis calls it in his critiques. In this worldview, human beings who are unproductive, weak, and vulnerable lose their “value,” and this diminishes their true humanity. It cannot be denied that terminally ill people have burdens to bear that are very heavy, and their caretakers also have many hardships. It costs a tremendous amount of time and money to care for someone who is very sick. Yet true compassion means “suffering with” someone – or allowing others to suffer with us – and while it is very humbling, the most intimate bonds of human caring can be nurtured in just such circumstances. I recall a friend who was dying of AIDS who told me he began to consider the disease a blessing – not for the suffering and ultimate death it would bring, but because he learned how many people truly cared for him. By allowing himself to be vulnerable to them, he learned that compassion is a form of love that binds us together quite intimately. We often hear the Scriptures say, “Fear of the Lord is the beginning of wisdom.” (Proverbs 9:10; Psalm 111:10). This means that we are wisest when we recognize that we are not gods ourselves, making all our own choices and creating our own realities, and when we realize that God’s law is not burdensome but the way that guides us to true human freedom. Although God always gives us freedom to choose whether to worship and obey God or not, he also makes it clear that there are consequences to our choices. While we know that God is merciful and compassionate beyond our imaginations, he also has taught us that we can choose to reject him, and such a choice leads to our eternal detriment. Wisdom dictates that if one decides to take to him- or herself the decision about when life should end, rather than leaving that decision to God, one should be aware of the real possibility that such a choice could backfire. If a person is suffering tremendously in this life and takes the decision to escape by ending one’s life, there should be no surprise if on the other side of this life, there is suffering that cannot compare to any earthly suffering. And there is no medication that will allow one to escape from this eternal suffering! God wants to give us eternal life and joy, but the wisdom that takes us there is fear of the Lord. We are talking here, of course, of those who, with clear mind and will, decide to end their lives. We know that most suicides are committed by people who do not have clear minds and wills, whose depression has locked them into such darkness that they do not think there is any other escape besides suicide. Just as we view this as a tragedy, but still feel real mercy toward the person, I am sure God’s mercy also goes out to these tortured souls. But the proposed law that allows physician assisted suicide usually stipulates that the person must be terminally ill and make a full and conscious choice to request the “medication.” Perhaps in some way, this is even more tragic for the person who ends life in this way, perhaps for the loved ones, and certainly for society itself, which actually fails in its compassion and mercy. A bishop in a state that already allows physician assisted suicide spoke of his mother in a care home, and how she was so readily offered the choice of ending her life with medication. It was an indicator that once the door is open to embracing death so easily, the slope to euthanasia – or a culture of euthanasia – is not far behind. It is certainly cheaper and easier to end a life than to care for it in the midst of suffering. Will decisions be made on economic expediency? Will others around the patient, such as heirs, be more motivated to aid in the rapid demise of the patient for their own benefit? Will this be another weapon in the hands of those who already abuse the elders they care for, a problem that has become quite serious? In light of all I have said, however, I do want to speak of the Church’s desire to care for the sick and to alleviate as much pain as possible. Physicians have told me that these days palliative care is so well developed that no one need suffer the tremendous pain that often comes with a terminal illness. While there is a sense in which suffering can be redemptive, united to the sufferings that Christ himself endured on the cross, the control of pain is certainly advisable and available. Nor does the Catholic Church teach that a terminally ill patient must exhaust all extraordinary means of medical care until the very end. Dying is a natural part of life, and it is meant to be the gateway to eternal happiness with God. But such is only possible when a person recognizes God’s sovereignty and does not give such sovereignty to any person or any institution, including oneself. As faithful citizens of Hawaii and stewards of the Gospel, I ask you all to:  Pray fervently that physician assisted suicide will not be permitted in our state;  Sign the petition that is being distributed by the Hawaii Catholic Conference and encourage your family and friends to do the same;  Contact your legislators and to ask them not to allow physician assisted suicide in our state, no matter with what euphemistic name it is cloaked. Visit https://www.hawaiifamilyforum.org/action-center/ to find out who your legislator is, send an email to your legislator and to sign an online petition. By signing up online, you will find out exactly when the bills are being heard and any call to action. The suffering of others is a call to us all, not to end life by offering a lethal “medication,” but to care for them in love, even when it is most difficult to do so. It is the way of love and true compassion that will lead to eternal joy in the presence of the One who is Love!